Whoa! Can you say epic read? Well, I can, and the title of that read is The Threat Below, Volume One of A Brathius History by author Jason Latshaw. 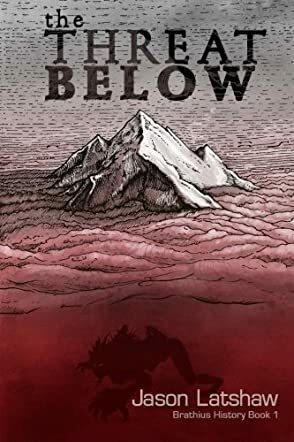 Follow the story of 17–year-old Icelyn Brathius, part of a small group still alive, living at the top of a mountain above the clouds and away from the nameless threat down below that threatens their very survival. When the group realizes that their water supply is in danger, and the poison is coming from Down Below, they have no choice but to send an expedition there to face whatever danger they might find, the very danger that wiped out their ancestors, for their very survival. But when Icelyn finds that the stories she’s always accepted as truth might have more to them than she thought, she realizes she might need to uncover more than just the source of the poisoned water, in order to truly make it possible for her and those she cares about to go on living. I loved this book. Loved. It. Young adult or no, The Threat Below is simply a delightful read for anyone who has an interest in fantasy, action, adventure, dystopian stories or just a unique and inventive piece of fiction. I also appreciated the fact that this story could easily be enjoyed by both young men or women equally. Author Jason Latshaw has done a fantastic job in creating characters that the reader will easily connect with and care about, and his world creation abilities are second to none. I highly recommend The Threat Below, Volume One of A Brathius History. I will certainly be watching to see what Jason Latshaw offers his reader next, and will be first in line to pick it up! The Threat Below by Jason Seth Latshaw is the story of Icelyn Brathius. She is just a seventeen-year-old girl who is living in a world that is far too dangerous for her. Some three hundred years ago, the human race went all but extinct. In an effort to survive, a group of humans takes refuge at the top of the mountain. Now they live above the clouds where nothing can hurt them. However, they rely on sources that run from down below. When their water is poisoned, she is sent with a group of other survivors to learn what and who has contaminated their water and solve the issue. However, once they are down from the mountain, Icelyn realizes the true dangers that lurked there. This is not a place where humans can survive. Learning new truths and secrets, Icelyn must survive and get to the safety of her mountain. The Threat Below was a great surprise. Latshaw has written a great novel with strong characters. The presence of the unknown could be felt in every word. You will be able to live the dangers with Icelyn. Each and every one of the emotions felt real. I really loved the fact that the novel was fast paced. Usually, fantasy novel tends to drag a little, but this one did not do that. The reader is immersed in the story from the get go. I was intrigued from the moment I started reading. And that is the best thing ever! I could smell, sense and live the danger. This novel is a perfect example of great craftsmanship. The Threat Below (A Brathius History, Volume One) by Jason Latshaw is a gripping dystopian, action fiction read! The story follows a group of survivors who live way up high on top of a mountain. The reason they live up so high is because a few hundred years prior, a horrific new entity arose on Earth and massacred humans to almost the point of extinction. The group that now lives on the mountain descended from those who were able to escape the brutality of the new monsters, and regrouped to form a new civilization atop the mountain peak. Conflict and life-changing decisions arise though when the group discovers that their water supply at ground level is being poisoned. In order to keep surviving on the mountain, a small expedition team, including seventeen-year-old Icelyn Brathius (the book’s heroine), must descend the mountain in order to save the water supply as well as face the monsters living below. I really enjoyed reading The Threat Below as I’m a big fan of dystopian fiction. I thought Latshaw provided a fresh angle to this popular genre and the overall plot line was original. Icelyn was an entertaining and likeable heroine and I think many readers will find her relatable. The storyline was fast paced, engaging, full of interesting twists, along with no noticeable grammatical issues. I was very interested as I read to find out more about the monsters living below and how the survivors would prevail. I would highly recommend The Threat Below to all fans of dystopian, adventure, and action fiction genres. About 300 years ago, unknown horrors massacred humanity to the brink of extinction. Survivors escaped to the top of a mountain, where their small population of descendants lives. When they discover that their water supply is being poisoned Down Below, an expedition, including 17-year-old Icelyn Brathius, must descend and face the monsters, the Threat Below, that wiped out civilization centuries ago. The Threat Below (Brathius History, Book 1) by Jason Latshaw is a multifaceted fantasy novel combined with mystery, suspense and adventure. I’m very impressed with the world building. As the survivors create a life for themselves on top of the mountain, two distinct groups are born; Cognates are the intellect and leadership, and Veritas are the prowess and strength. A ration system is essential for survival, therefore resources and population growth are tightly controlled. There are silent yet profound tensions between the Cognates and the Veritas, and this rears its ugly head when the water trouble starts. Trust between the communities is not as deep as one would hope. I find their system flawed in terms of ethical matters. Icelyn is comparable to strong young female protagonists that attract YA readers and moviegoers today. That said, she’s far from being a clichéd character. Although she is well-fleshed out with relatable strengths and flaws, I sometimes find her thinking naive due to her upbringing as a Cognate. However, experience makes one mature, and Icelyn’s journey to Down Below opens her eyes to many things. Simply put, this is a commendable and ingenious series from Latshaw. The Threat Below by Jason Seth Latshaw is a YA post-apocalyptic series starter set three hundred years into the future after something terrifying arose and pushed humanity to the brink of extinction. Now, a small remnant – the ancestors of the survivors who were able to escape the massacre below – lives above the clouds, on the top of a Mountain. When they discover that their water supply is being poisoned Down Below, an expedition, including a seventeen-year-old girl, Icelyn Brathius, must descend and face the monsters, the Threat Below, that wiped out civilization centuries ago. Icelyn quickly learns that all is not what it seems as she uncovers secrets hundreds of years old and struggles to stay alive in a world where no human is fit to survive. The Threat Below by Jason Seth Latshaw is a well written YA debut, the plot is intriguing, and every character has hidden depths and facets of their personality. In a world as rigidly regimented as Icelyn's is, all is not what it seems and as a reader you'll find yourself quickly flipping pages as more and more is revealed. I was a bit jarred by the abrupt shifts between first person and third person, but after a while I was able to get used to it and it doesn't take much away from the story. The Threat Below by Jason Seth Latshaw is perfect for fans of dystopia, but I think it will be a good read for horror fans who may be looking for a unique and thought provoking addition to their favorite genre.